With numerous film adaptations under its belt already, Rudyard Kipling’s story collection The Jungle Book receives its most expensive re-interpretation to date. This “live-action” version (a term I hesitate to use, given how much reliance there is on computer-generated effects) is most closely related to Disney’s 1967 animated version and could be considered more of a remake of that film rather than a strict retelling of the source material from Kipling. While this newest iteration puts forth some truly jaw-dropping visual effects and an outstanding voice cast, there’s still something hollow at the heart of this film’s execution that makes it come across as more of a nostalgia cash-grab rather than a faithful re-telling of the original story. 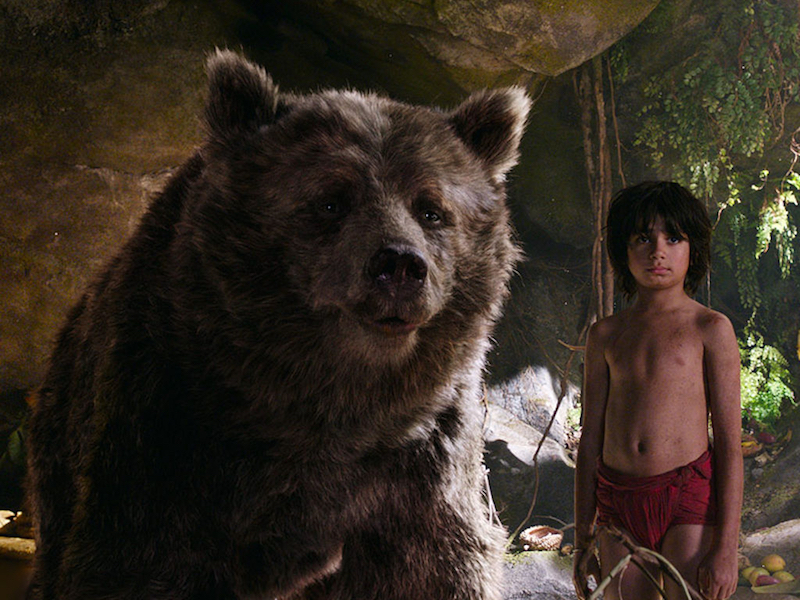 This film follows the same narrative beats of Disney’s previous animated work, which introduces Mowgli (Neel Sethi) as an orphaned young boy living among talking creatures in a mythical jungle. His surrogate father, a black panther named Bagheera (Ben Kingsley), also acts as Mowgli’s protector as he is being mercilessly hunted by the vengeful tiger Shere Khan (Idris Elba). On his journey to flee the now unsafe jungle, he also receives aid from the sloth bear Baloo (Bill Murray) and a smorgasbord of other animals with more questionable motives at play. I should re-iterate early on just how blown away I was with director Jon Favreau’s visualization of this jungle landscape. I didn’t have high expectations for seeing a film shot entirely with green screens but there’s an attention to detail in the settings and the realization of each creature that is breathtaking and clearly state-of-the-art. As good as the movie looks, the sound design may actually be even more laudable than the visual achievement put forth. When you take into account the cacophony of ambient noise present in such a vast nature setting, it’s mind-boggling to think how much time went into re-creating all of the levels of auditory realism. In addition to the stellar work from the audio side of things, the vocal casting is particularly on point as well. Bill Murray brings a warm humor and quiet gentleness to Baloo and Idris Elba is properly menacing as the most despicable version of Shere Khan yet. Lupita Nyong’o, who plays a wolf and mother figure to Mowgli, is absolutely astonishing in the few scenes that she has in the film. Sadly, Neel Sethi’s performance isn’t quite up to the level of his co-stars and is undercut by stiff line readings and an underlying artificiality behind his interactions with the computer-generated creatures. On the surface, there may not be as much to criticize here but my chief complaint is perhaps more of an esoteric one: this just feels like a very safe play for Disney at this point. I won’t deny the craft and creativity that went into making this film but at the same time, it could have been a much more memorable achievement if Favreau and his production team hadn’t hedged their bets with a more conventional storytelling approach and an almost slavish reverence towards the far from perfect animated movie. We’ve seen with recent successes like Zootopia how rewarding it can be when Disney steps even a bit outside their comfort zone and in terms of narrative ambition, The Jungle Book feels like more of a step back than it should have been.